One of the most challenging concepts for the color layperson is the reading of undertones. When working with clients and making a statement such as, “there are blue undertones in this beige”, they often look at me and tell me that they don’t know how I see these things. It’s almost as if they ascribe some magical power in my ability to see such tones. Actually, it’s quite simple…I’m going to remove the roadblock which prevents most folks from identifying these. After you read this page, you too will be able to master subtle color. Being able to see these undertones is probably the most important skill that will keep you from making a big color mistake. How many times have I heard my clients tell me that they didn’t know the color they chose was going to look the way it did when it was applied? If I had a nickel for each of these stories I’d be writing this from my private Caribbean island. One of my basic theories of color identification is the barrier between your logical brain (left hemisphere) and your creative visual brain (right hemisphere). They process the same information in very different ways. In our culture and society, we place value on logical, deductive thinking. Our schools are structured to reinforce this type of thinking, therefore, our creative side is not nurtured and in most people, not developed to its full potential. The description of a Renaissance man or woman is one who masters many disciplines, this includes the sciences AND the arts. When you are done here, you can apply for status as a Renaissance member! LOL! Because language is so important and language is ruled by our left brains, it often trumps and betrays what our eyes are really seeing. For instance, we go out and buy some bedding which has some deep wine colors in it. You tell your friend about your purchase and she/he says, “what color is it?” You immediately say the word “red”. Yes, it’s true, the bedding is red but that is really not an adequate description. OK, so now you said the word and off you go to the paint store to pick a color for your bedroom walls and your new bedding. Your brain said “red”, you go to the paint chip rack and your brain tells your arm to reach out for “red”. Your left brain didn’t say, “value 8 red, low chroma, with a blue undertone”. If it did, congratulations…you can have my job! But most likely it did not so you gather up a handful of very bright, stop light reds…totally not paying attention to what your right brain says and sees. The room gets painted and yes indeed, it’s way too big of a color OR your bedding is a red with blue undertones and you picked a red with yellow undertones. 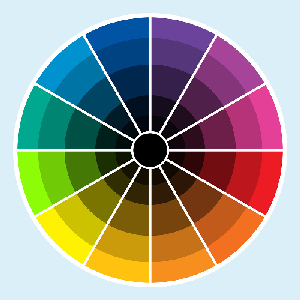 Locate red on the color wheel; as you travel in either direction from the red around the wheel you notice that you can travel in the direction of yellow or towards blue. Simply, reds which move towards yellow are said to have a yellow undertone…the same holds true for reds moving toward the blue, they will have a bluish caracter…. Undertones become very easy to see when you compare different tones of the same color. It takes time and training to be able to see a color’s underlying character individually…your color specifier can do this easily because he has trained his/her eye to do this much in the way a coffee taster or wine expert can identify nuances in their wares. Here’s the rub…colors which are relatively pure such as reds, blues, greens, are quite simple to identify because they do not contain too many other colors. Red, blue and yellow are primary colors, this means that they cannot be made. Mix two primaries together and you get secondaries (green, orange, purple). The more colors you mix together, the further and further you travel away from primaries until you get grays. This is a big concept to wrap your head around…they are grays. I like to call them colored neutrals as they are very far away from being primaries. Calling them colored neutrals helps my clients to understand that all grays are colors in their own right. When I say the word “gray” to my clients (here’s that left brain problem again) most of them think of a concrete block. Yes, concrete is gray and even concrete has an undertone but what I am really referring to is gray as a muted tone, one which we as color specifiers call a low chroma color. That simply means it is made up of many, many colors and is very muted. So what does this mean….it means that these colors have the capacity to appear very different under variable lighting conditions and are dependent for their character greatly upon the things which surround them. They often do not have a single dominant undertone but can be pushed to looking rosy or violet or blue, etc. by how we place them in the framework of other colors. So that a gray placed with a red will look greenish….a blue placed with a beige will make that beige push towards gold. If you want to “educate” your eye for seeing these subtleties, go to the paint store and gather a bunch of beige chips. Cut them off the strips individually, make sure you cut the white borders off too. In order to compare these colors on a level playing field, make sure they are all the same degree of lightness or darkness. If you really are serious about learning, get yourself a value scale (they’re inexpensive) from the art store so that you can accurately identify just how light or dark a color is. Compare all these like chips against each other. When you assemble a field of these, you will easily see that they all look very different. Individually they do not but in a mass, it is easy to see how some are bluish, green-y, etc. Now take two bright colors such as red and blue and compare each of these different beiges against that brighter color. Then remove the beige and look at it by itself. I think you’ll find it interesting how the juxtaposition of a beige with a primary can pull out different tones in the beige. without fear of surprises…and that’s a very good thing!